Your Blue & Gold Card is more than just your official identification card. It also provides you with access to services and discounts. Please protect your Blue & Gold card and keep it with you. 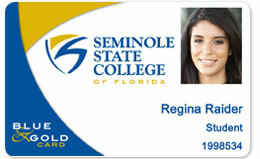 Be an enrolled student or current employee of Seminole State College of Florida. Present a government-issued identification, such as a driver's license, passport, state of Florida identification card or military ID to any Blue & Gold Card Services campus location. For more information, please visit the Frequently Asked Questions (FAQs) page.